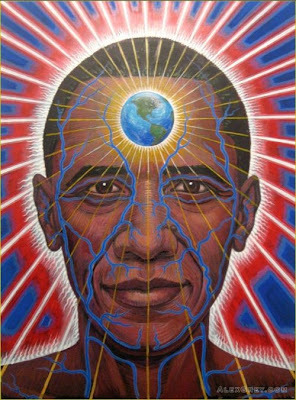 Alex Grey too joins in with his artistic rendition in hope of the change Barack Obama could bring to the World as the President of the United States of America. We hope he sets a good example of honesty and service in the best interest of humanity and Planet Earth ! Alex Grey paints Barack Obama ! After hearing Barack Obama's speech in BerIin, and noting the degree of excitement and hope that he generated throughout many countries besides the US, I started to see him as one of the first true "world leaders." This may be partly because of his extraordinary childhood and political life that has bridged many cultures. Obama's restraint and intelligence, exhibited as foes were bating him throughout the campaign, his heartful clarity coming through in his talks are all qualities of a highly evolved person. We need to consider our planetary citizenship, because solving the world's ecological and economic problems, and creating a culture of peace and reconciliation will require the co-operation of all nations. Perhaps you can use this symbol of Barack Obama to send him a prayer of support, to send all the loving hopeful healing and creative energy that we can focus on him so that he can perform the task of leadership in the most effective and powerful way for the greatest good, for the greatest number.